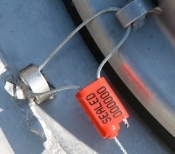 EZ Loc Cable Seals are a medium-duty cargo security seals featuring non-preformed security cables that fray when cut with various marking options for customized tracking.Our Cable Security Seals provide you with the measured security you need. 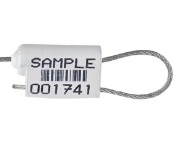 EZ Loc Cable Security Seals are CTPAT/ISO 17712 compliant***. Lock body is available in white, in stock and ready to ship. Corrosion-resistant zinc casting, cold stamped imprint "SEALED". 1/8" x 12" in length. Cable pulls tight for maximum security.